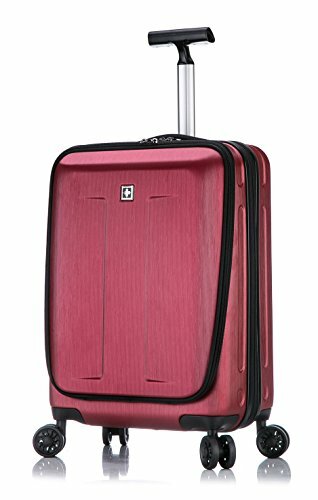 Do all Smart suitcases come with a Power Bank/battery already included? What are the new 2018 airline rules? Best Carry-On Luggage with Built-in Charger? What do you get when you combine a suitcase with a USB charger? Aside from a few curious looks, you get the latest in luggage design – also known as Smart luggage. These days, you can now charge your phone or laptop from the convenience of your own suitcase. 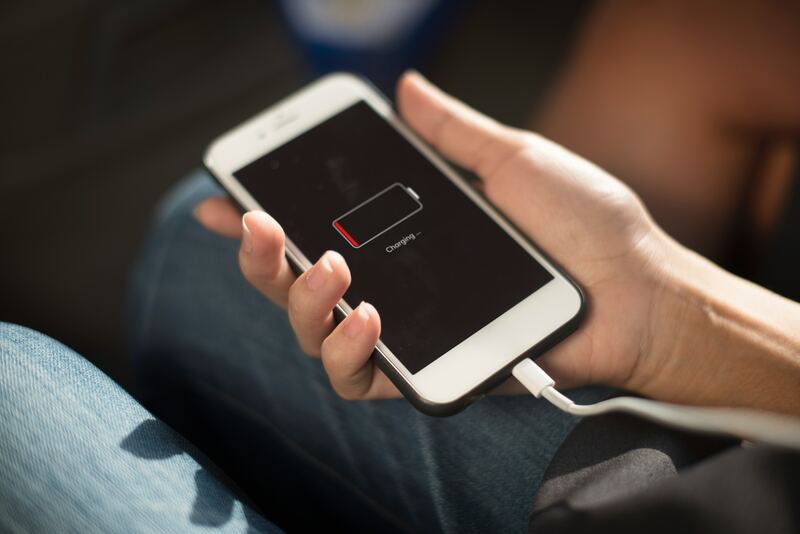 For the last year or so, luggage brands have begun to take advantage of a simple modern problem–how do you keep your phone/laptop/device charged when you’re traveling? Sure, there’s that single charging station at the airport that everyone seems to have found before you (seriously, why am I the last one to find it?). But no one wants to start a brawl, when you’re already anxious to board your flight. These new Smart suitcases now come with an integrated USB charging port. Just plug your device into the suitcase’s USB port and charge away. It’s as simple as that, yet somehow no one thought of this until recently. Suitcases are central to our travels, so it makes sense to add a few more bells and whistles to make our journey even easier. Before I get into my favorite Smart suitcases, let’s talk about Power Banks. Before your eyes glaze over, trust me it’s all really straightforward. A Power Bank is just a rechargeable battery that powers this whole Smart suitcase situation. It lives in your suitcase, so to speak. Hidden inside your Smart suitcase, is a built-in cable. This cable connects to your Power Bank. At the other end, the cable goes straight to the external USB port. Then, just plug your device into the external USB port and enjoy the convenience of your portable charging station. It’s pretty straightforward and makes sense once you see the suitcase. I’m not a tech person, but trust me it’s easy. Some Smart luggage come with a free Power Bank, but many don’t. Personally, I prefer to shop around for a Power Bank that gets the best reviews and doesn’t need recharging too often. I don’t want an inferior Power Bank thrown in for “free”. And considering airlines now want the Power Banks to be removable, it guarantees that you will be able to remove the battery when asked. One thing you need to know, before shopping for your new Smart luggage, is that as of 2018 many airlines now require the battery in your suitcase – the thing providing the charge – to be removable. Some luggage companies did not see this coming and sadly did not plan their designs with this in mind. Fortunately, some clever companies out there were one step ahead and made sure their batteries could be removed to meet the new airline rules. Now, you may ask, which Smart suitcases meet today’s airline requirements? I looked at several suitcases and these are the total package, great suitcase and the coveted USB charging port. Read on for my favorites. Aimed at business travelers, this luggage with charger from Travelpro is a suitcase any traveler would love. With an external USB port for charging your device, this Smart carry-on luggage is a handy solution to a common travel problem – charging your phone, laptops, and devices on the go. Luggage with chargers are still pretty new, so I wasn’t surprised to get a few curious people looking at me charge my phone at the airport. Considering most airports have a handful of charging stations (if that), I’m sure people were a little jealous that I had my own. By the way, don’t forget to connect your own Power Bank or else buy one separately. This suitcase is simply the coolest carry-on for the price. The molded design of the exterior is eye-catching and special. What makes this suitcase though is the front pocket. Even though this suitcase is a hardshell, you can still access items in the front pocket when the main suitcase is zipped up. For the price, this is a luxurious suitcase. It offers everything I need with a few bonuses thrown in like the built-in lock and external pocket. To take advantage of this USB luggage, remember to buy a Power Bank/charger separately. If you’re new to power banks, they’re basically a big rechargeable battery. This suitcase has a dedicated pocket to hold your Power Bank, by the way. 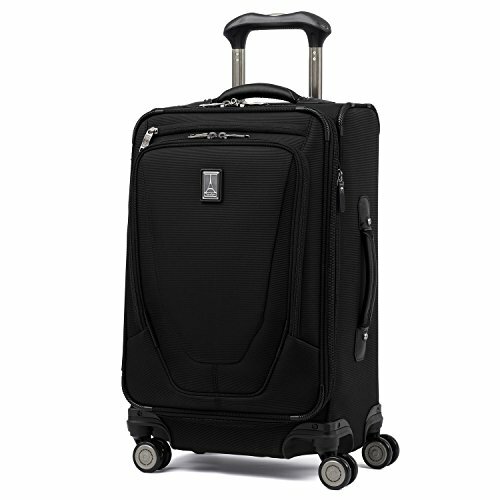 A suitcase packed with Smart features, the Travelpro Crew 11 Spinner Carry-on was designed for the rigorous demands of flight crews, but has been distilled for the average traveler. Charge your phone on the go, while enjoying the thoughtful design of this modern suitcase with charger. For the serious traveler, this will tick almost all your boxes. It’s not the most modern-looking suitcases I’ve seen, but it more than makes up for it with its innovative features. To take advantage of this USB luggage, remember to buy a Power Bank/charger separately. If you’re new to power banks, they’re basically a big rechargeable battery. This suitcase has a dedicated pocket to hold your Power Bank, by the way. I don’t know about you, but one of the most basic but essential features for me are spinner wheels. It’s usually not as important in carry-on suitcases, but I just love the easy maneuverability. 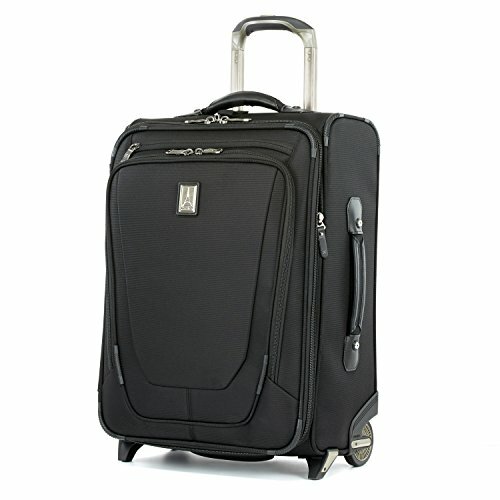 This suitcase comes with four spinner wheels, which rotate 360 degrees. They also have a patented magnetic system, which keeps each wheel rolling in unison. 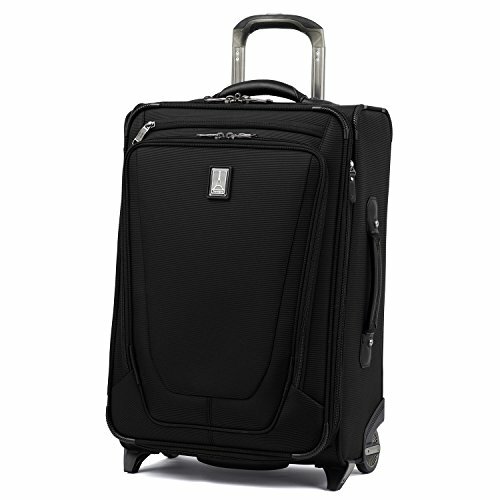 Another great suitcase from Travelpro, their 20-inch international carry-on fits perfectly in the smaller overhead compartments of international planes. We’re slightly spoiled in the U.S. with larger carry-on allowances, but no need to worry about with this Smart suitcase. This suitcase is definitely compact, which reflects Europe’s (and beyond) smaller carry-on allowances. 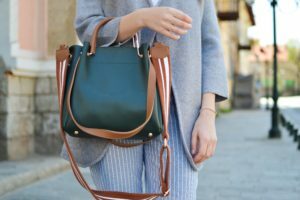 However, I was able to pack four or five outfits – two pairs of jeans, a sundress, three blouses, toiletries, pajamas, and a pair of ballet flats. Not bad for a suitcase of this size. Make sure to connect your own Power Bank or else buy your favorite battery separately. 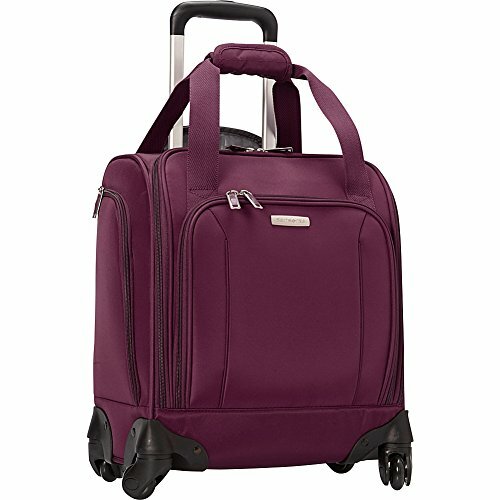 Great for carrying on domestic airlines, the Travelpro “Crew 11” 22-inch suitcase offers a spacious interior in a compact shape. You can instantly sense the quality and durability. Probably the largest in the Crew 11 carry-on category, you will be able to take it onboard most domestic flights. Although it doesn’t have spinner wheels, the bag’s compact size doesn’t make this an issue. The two wheels have ball bearings, which make the suitcase roll very smoothly. Overall I found the bag very durable and well made. The Crew 11 series have been designed with flight crews in mind, so this is another well-designed suitcase in the series. To take advantage of this USB luggage, remember to buy a Power Bank/charger separately. Sometimes a compact travel bag is just the thing you need. For those times, this sweet little underseat bag is just the ticket. Simply put, this piece of luggage with built-in charger, is great for business or travel needs. On flights, it fits right underneath your seat, so anything you may need is within reach. If you need to carry your laptop with you, there’s a handy zippered pocket on the outside that keeps it protected. Inside it has enough storage for an overnight stay or for daily work commutes. To use the USB port, connect a Power Bank of your choice and connect it to the integrated cable. And voila! Portable charging station. Depending on the kind of trip I’m taking, sometimes the best thing to take is a backpack. For short trips, a simple backpack is all I need. Especially if I’m going somewhere with lots of steps and slopes, which would make pulling a suitcase a chore. 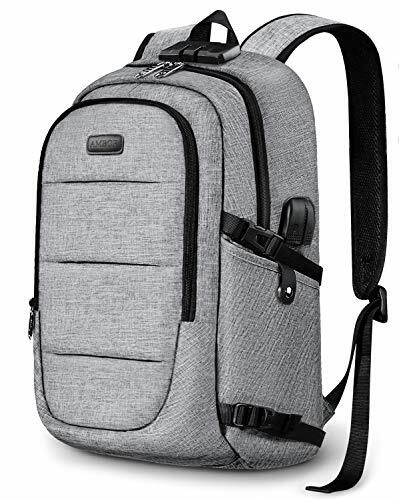 This backpack is a step-up from my college days and comes with a built-in USB port. As well as for travel, this suitcase would be perfect for students, teachers, or commuters. It’s very light and comes with a water bottle pocket for on the go hydration. Like many Smart bags, don’t forget to use your own Power Bank. Connect it to the integrated cable inside the bag and then you can start charging your device. If you’ve been thinking about getting a smart suitcase, make sure the power bank (ie. battery) is removable. Before pulling the trigger on your next suitcase purchase, make sure to keep this in mind. Once you start using your smart luggage, you’ll wonder how you ever traveled without it. They’re so incredibly handy and easy to use. I hope my guide has helped to point you in the right direction. Have you bought a smart suitcase? If so, what were the pros and cons? I’m always curious to hear about your experiences.